Swimming's like every kid's favourite past time. And my kids are no different! They spent many evenings splashing about in our apartment pool. And I was happy when I got review one of Cheekaboo's swimwear for Khye. 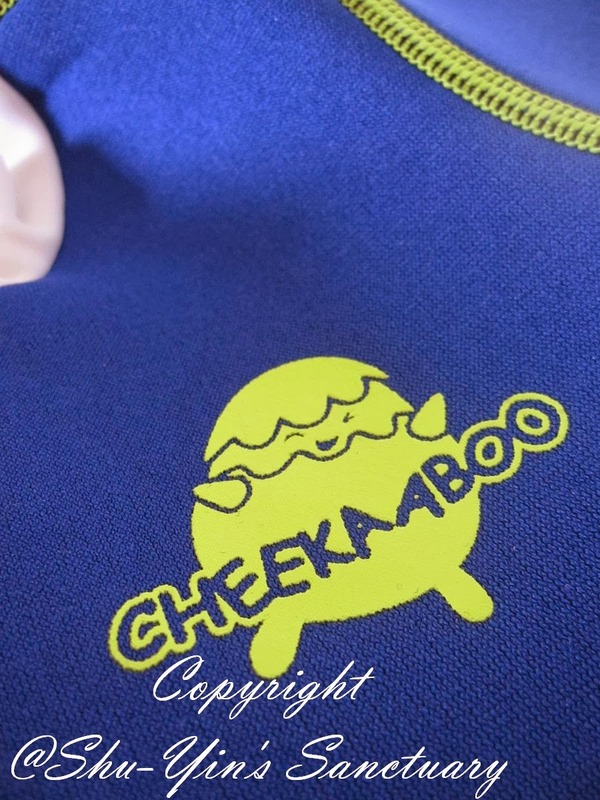 CHEEKAABOO offers a range of cheerful and bubbly protective swimwear and floaties designed for the comfort of your precious little ones. They are all about bringing fun and play into the lives of children and their mummies and daddies. More specifically, the splashing, water type of fun! 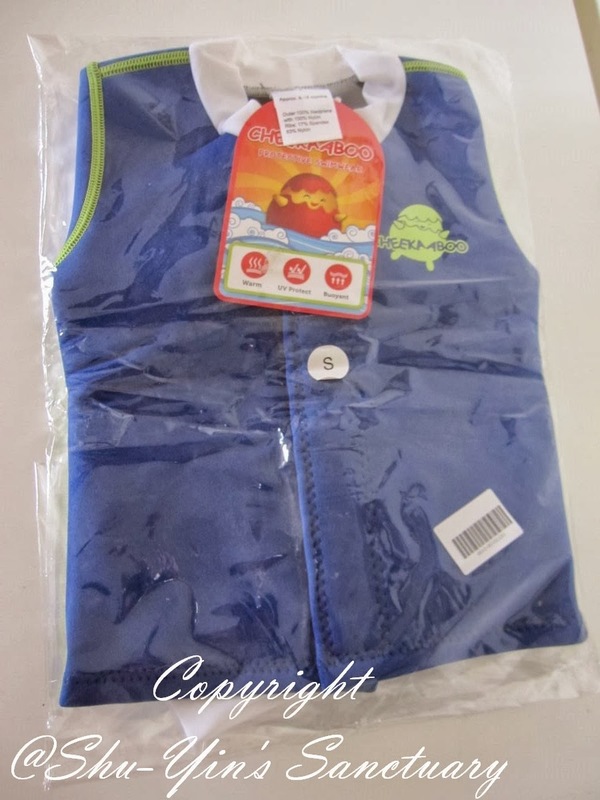 They make specially designed children’s swimwear and floaties from quality neoprene material which are innovative and practical to wear, making playtime special, simply more fun and enjoyable! The package arrived in an envelope. 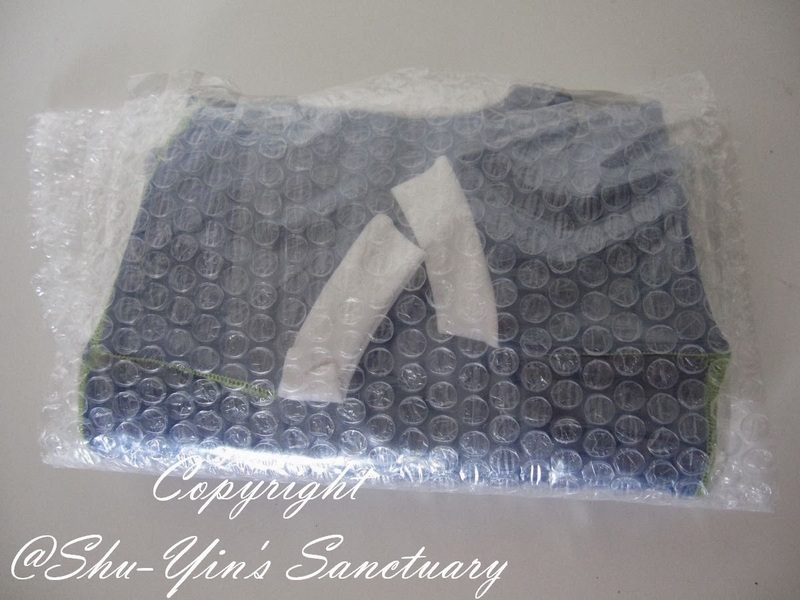 Upon opening up the envelope, the swimsuit is all wrapped up in the bubble packaging. I like this because the bubble packaging gives the swimsuit a bit of cushioning and thus protects it from scratches and all. 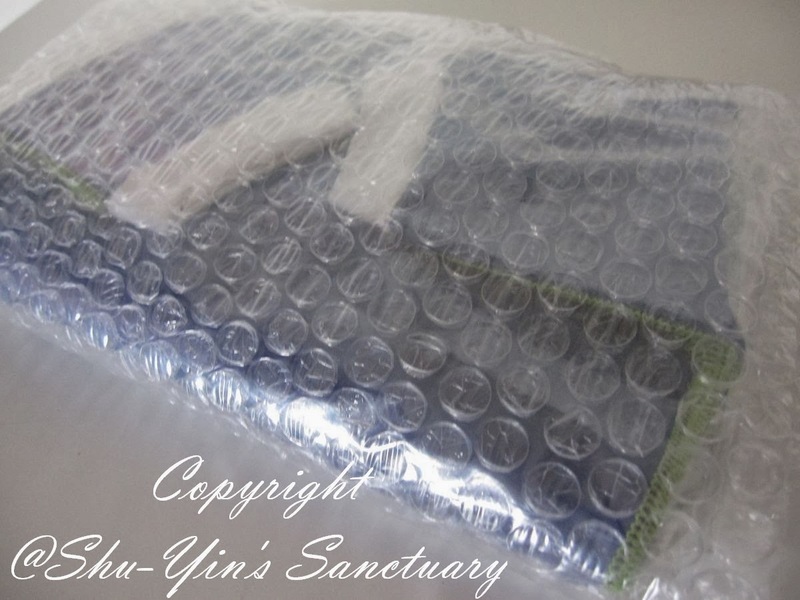 I removed the bubble packaging, and it is still wrapped out in another layer of plastic. 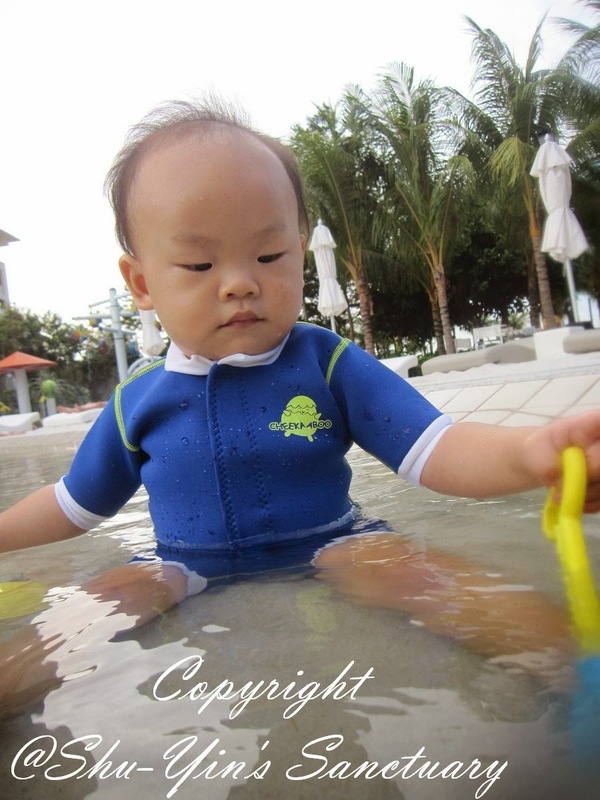 In it, it revealed the swimsuit I chose for Khye, the Huggiebabes - a two piece swimsuit with a top and an in-built nappy, sized 6-18 months! I like that it is two-piece as this separation makes it easier to wear and take off. There was a brand tag attached to it, and on the left imprinted the Cheekaaboo logo. 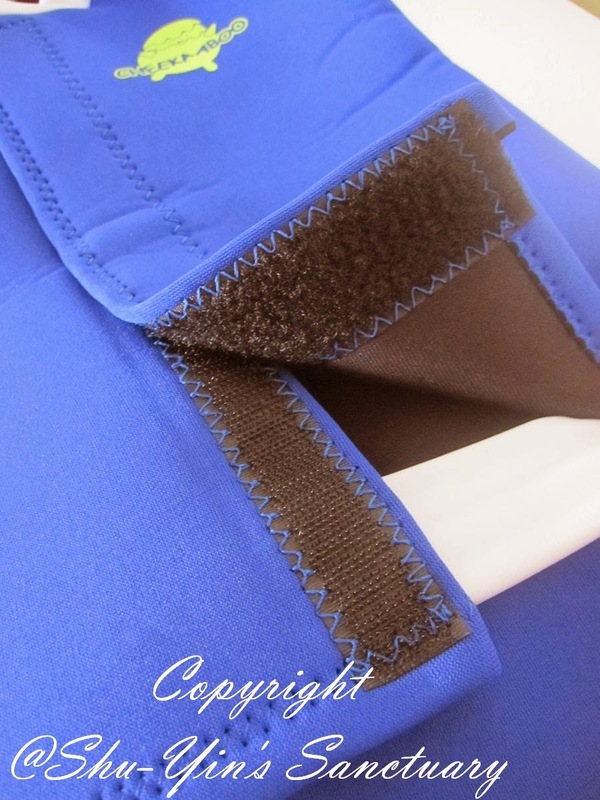 The material is made from 3mm soft, double lined neoprene with insulating and sun protection properties. 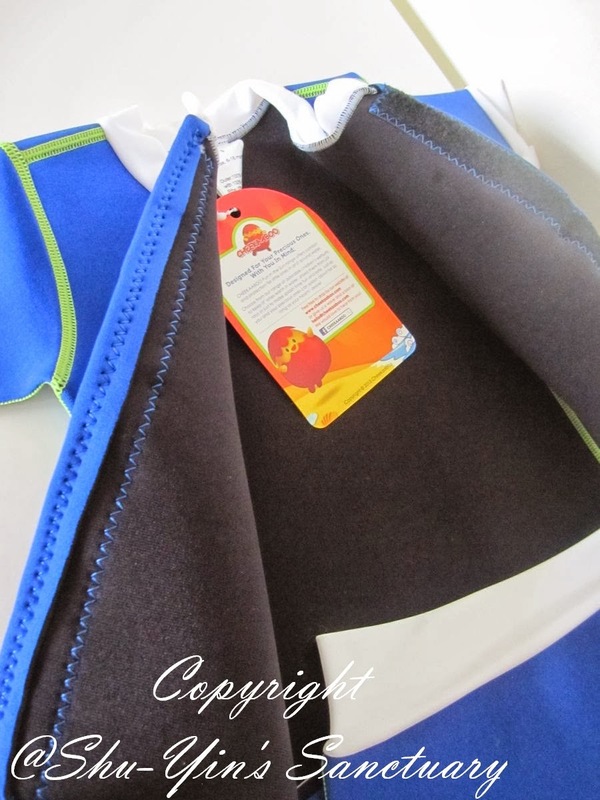 Neoprene has insulating properties that help to trap water between the suit and the child’s skin to create a layer of insulation from cold, hence it can keep a child warm in and out of the water. It is also a water-resistant material that offers UV protection. This is good because as you know, babies aren't very good in regulating their body temperatures. 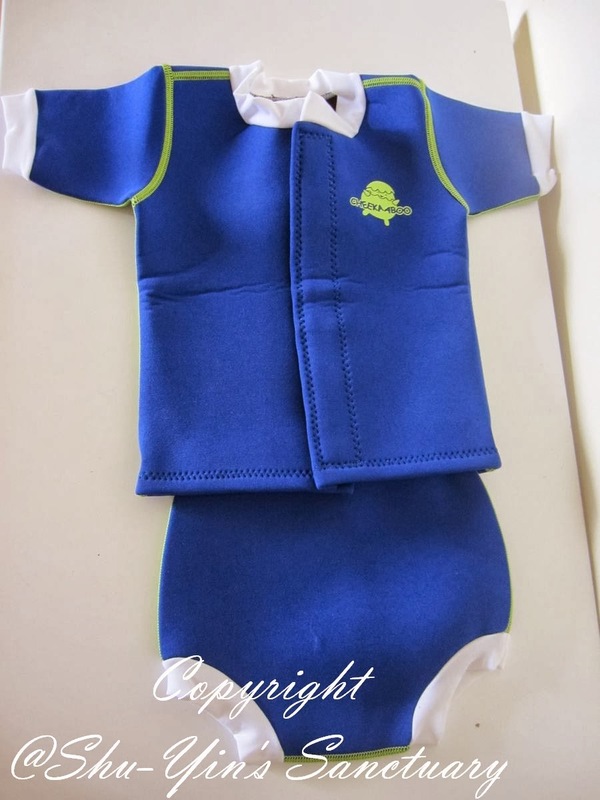 So this protective swimsuit keeps you babies snug and warm! 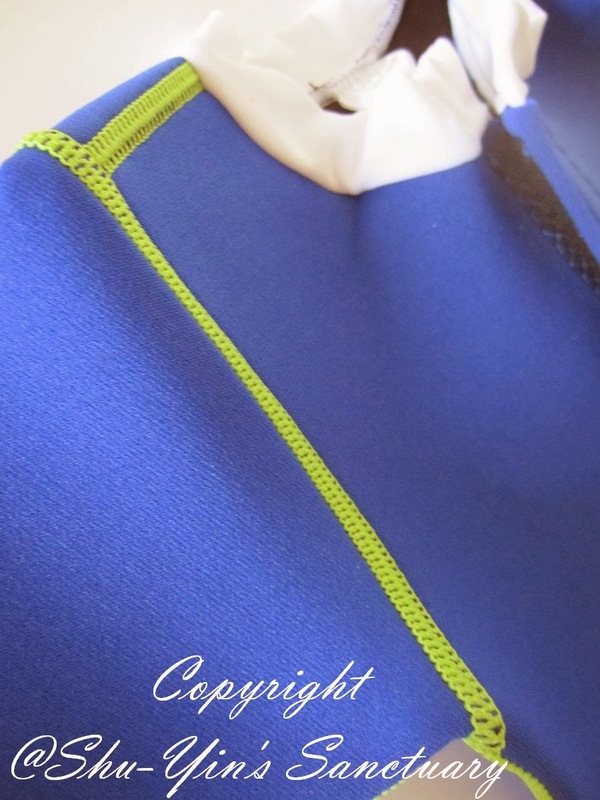 The previous swimming suit that Khye wore also offers UV protection, but not the warmth, so I was intrigue with it. The closing and opening of this swimwear is by this long strip of velcro , which is actually of very strong quality as it zaps on very tightly. 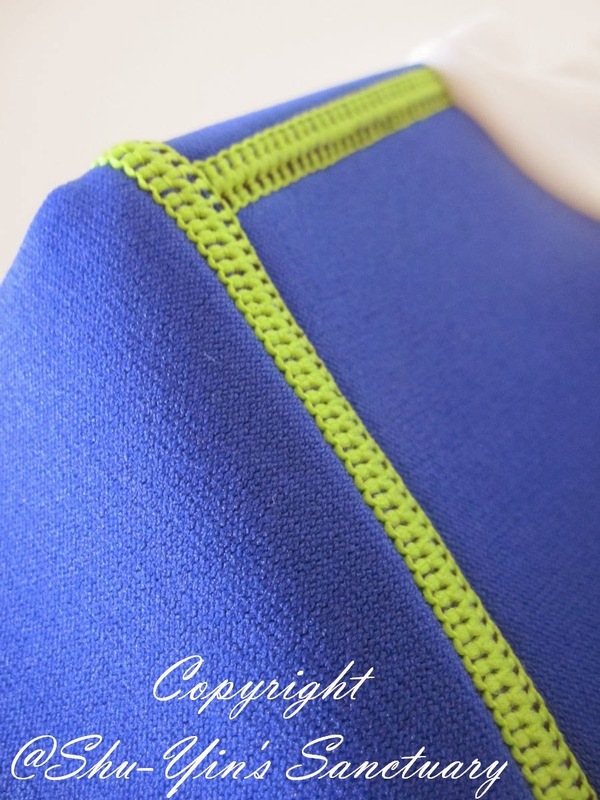 I also like the contrasting bright yellow stitches at the shoulders and arms of the swimsuit which is neat and clean, and provide some colour visual. 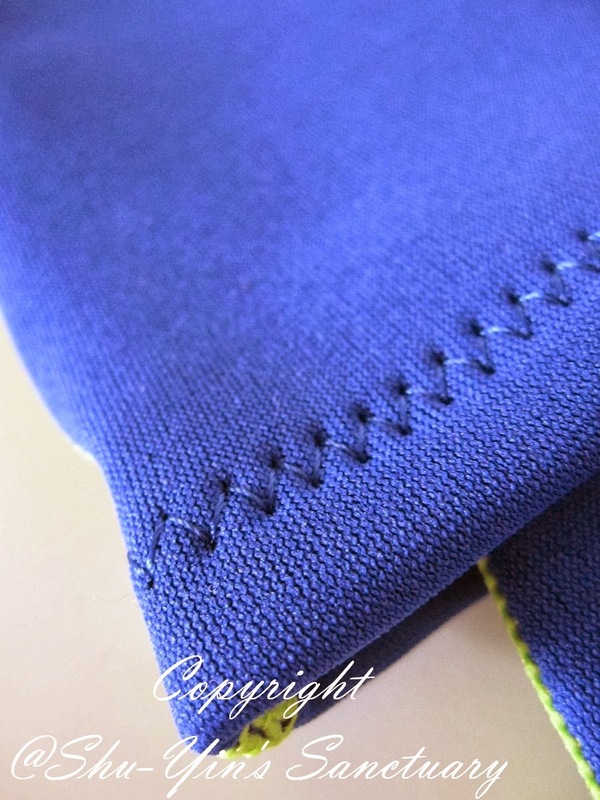 And the other stitches are also neat and strong. 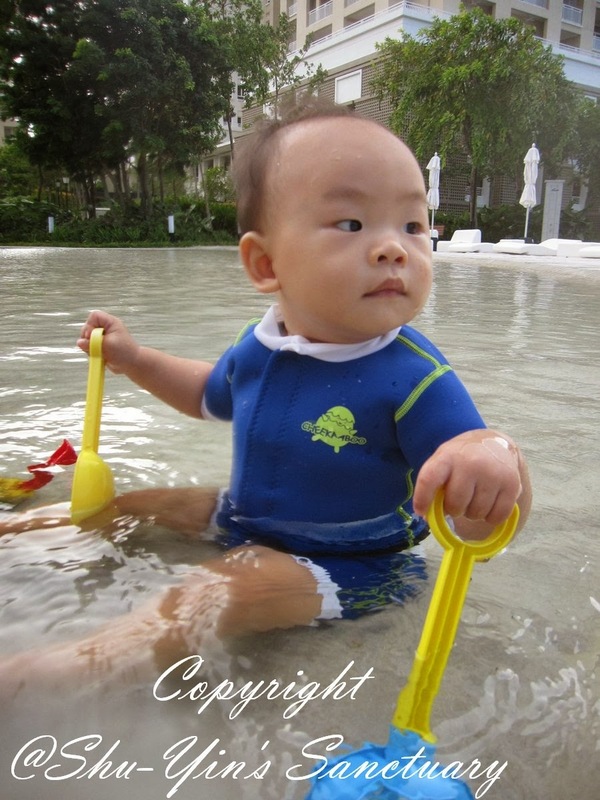 We tested this Huggiebabes swimsuit on Khye. These few months had been rather cold, with the chilling Northern wind. So we had quite a rest from swimming at our apartment pool. 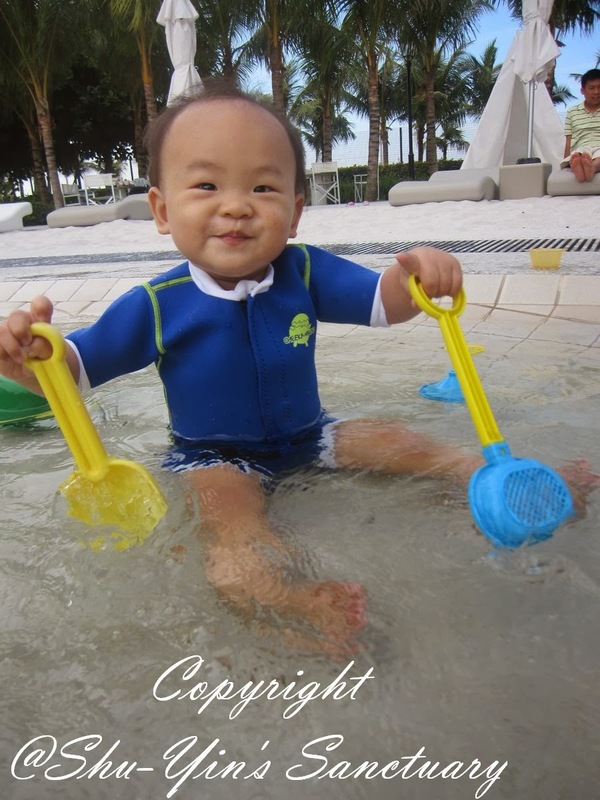 But when my cousin invited us for some water play at his condo, we went along too. There was a shallow sand pool there which I think was good to test out the swimsuit. It was very easy to put the swimsuit top on for Khye, no fuss at all. I laid it flat on the ground and then put Khye on top of it. Put his arms through the holes and then just zapped him up. Although easy to put on, it was quite a tight fit for Khye at 15 months. But then Khye is a big baby, but it still fits, though snug. And also this is meant to be a snug fit to protect them from the cold. As for the in-built nappy, it was not so easy to put it on. I think this is because Khye has chunky thighs and so I need to slowly pull the nappy up. Imagine wearing a super tight pair of thighs. Not so easy right? Haha. 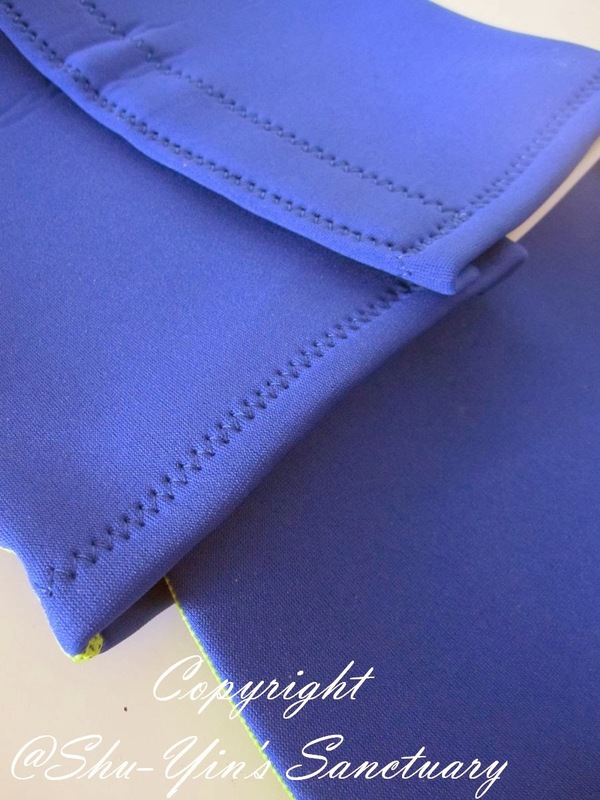 But then it is SUPPOSED to be tight, as this extra snug thigh bands feature is to prevent unwanted pee/poo leakages. So I'm super ok with this. Anything that prevents leakages, right! Khye was super happy though in it and was even more happy when I put in in the sand pool. The water goes up to his tummy and he was happy there splashing away. This is how it looks like zooming in. All snugged in his Huggiebabes swimsuit. And as the Northern wind blows coolly, coupled with the cool water in the sand pool, I had peace of mind because I know Khye is protected from the cold. This swimsuit keeps Khye warm in and out of water by creating a layer of insulation from cold between the neoprene suits and Khye's skin. Khye was smiling cutely with his mouth closed when I took some photos of him. 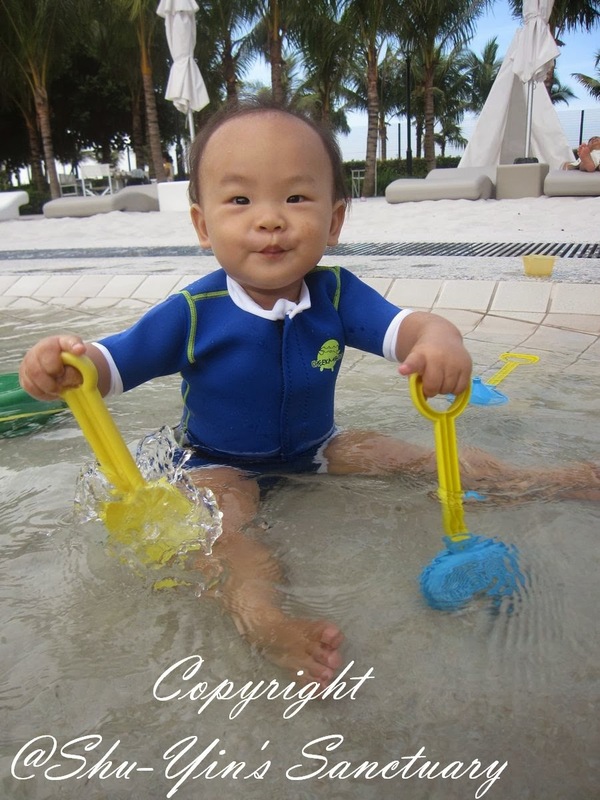 He was comfortable in his swimsuit and happy in the pool. And also I had peace of mind knowing he is wearing his in-built nappy, knowing that he cannot accidentally make a poo and mess up the whole sand pool! That would be a disaster I don't wish to happen, lest by one of my kids! 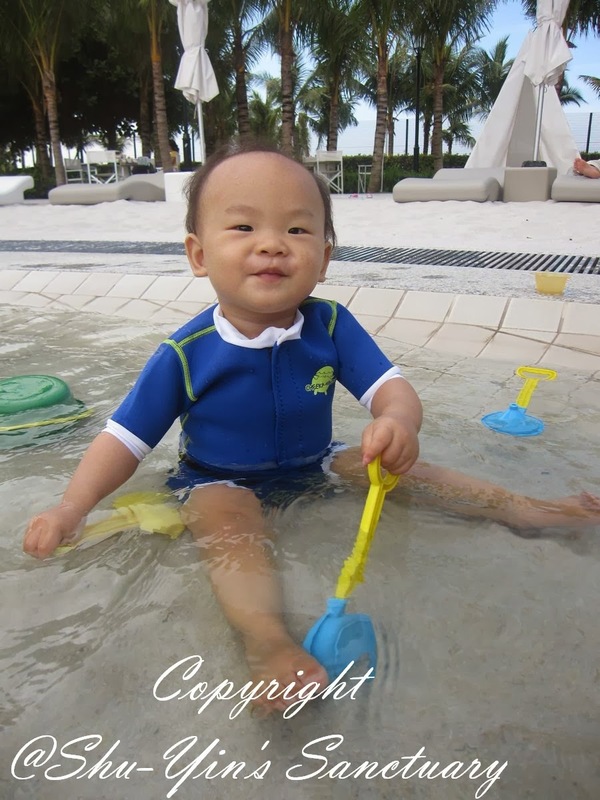 After awhile, I took him up from the water and put him just on the sand, to test out whether will it also keep him warm out of the pool. True enough, it kept Khye warm even out of the pool. 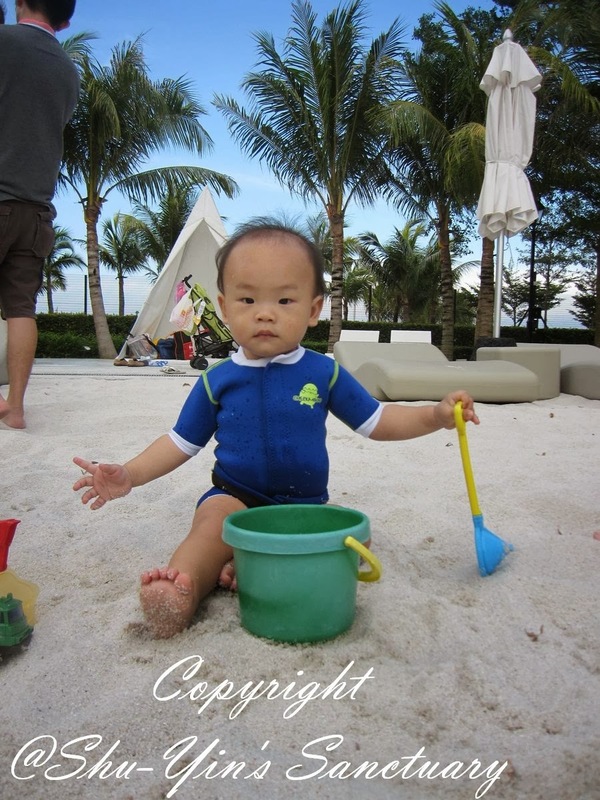 There was no complain or shivering from Khye, while his brother Shern was shivering away with his wet swimsuit while doing sand play. But after some 1/2 hour or so, I noticed that his body was a bit sticky with some sweat when I removed the swimsuit. I guess this is the only bad thing. If you wear this swimsuit for too long without being in the pool, in our climate, it can make you sweat a little. 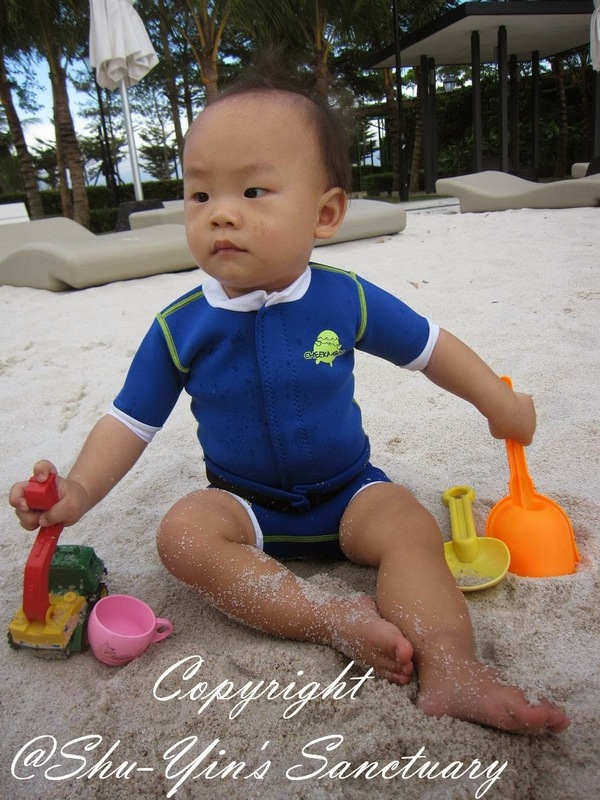 As mentioned, this is the first time I'd come across a swimsuit for babies and kids that protects and keep them warm. 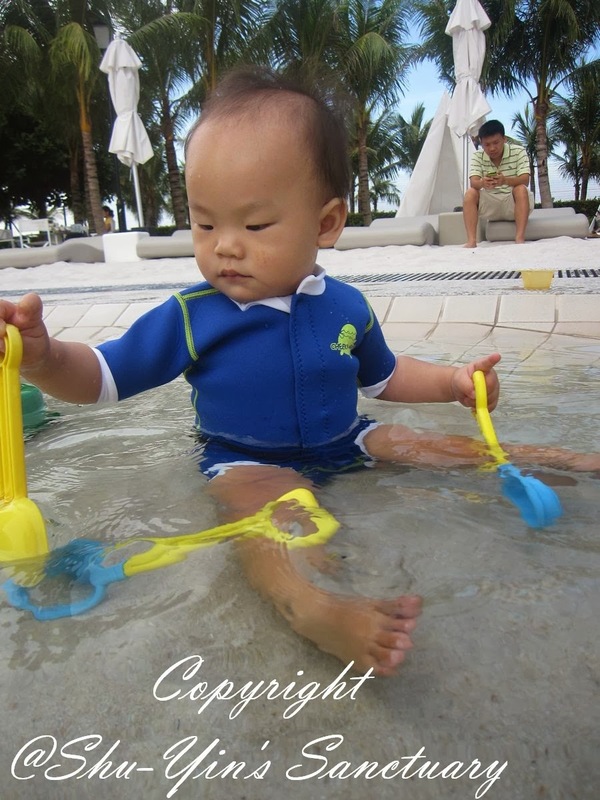 All in all, I think this is a good protective swimsuit for babies and kids, giving parents out there peace of mind. The price is reasonable given the high quality and protection it provides. 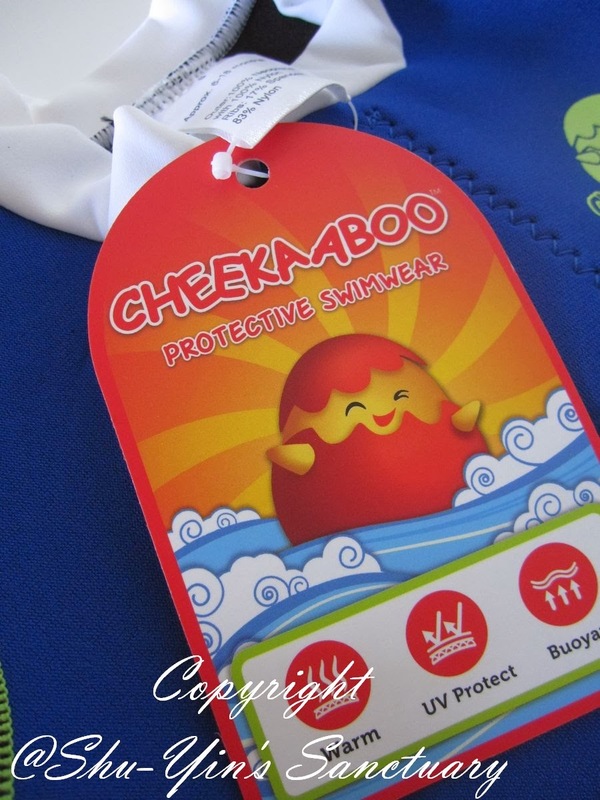 Please visit Cheekaboo's Website to purchase their protective swimwear or floaties. Browse around as they have quite a selection for babies and kids. Why not give your baby his/her first Valentine gift this February? Give your baby the give or warmth and protection, while giving yourself a peace of mind this Valentine! - a one day promotion offer of 20% off STOREWIDE on Valentine’s day on 14 Feb 2014. 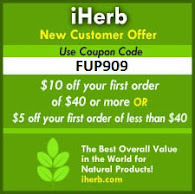 Just enter discount code FIRSTVALENTINE2014 upon checkout. - 10% off STOREWIDE at their Website valid until 31st December 2014, using discount code SHUYIN2014 upon checkout. Upon purchase from their store, there will also be a free gift valued from RM19.90 - RM79.90. 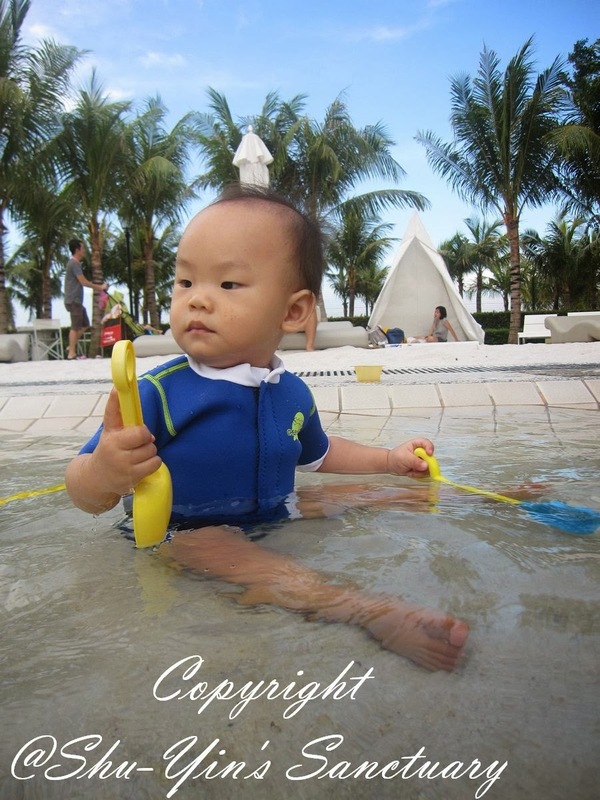 - Post up a creative photo of their baby wearing Cheekaaboo in the Facebook page. 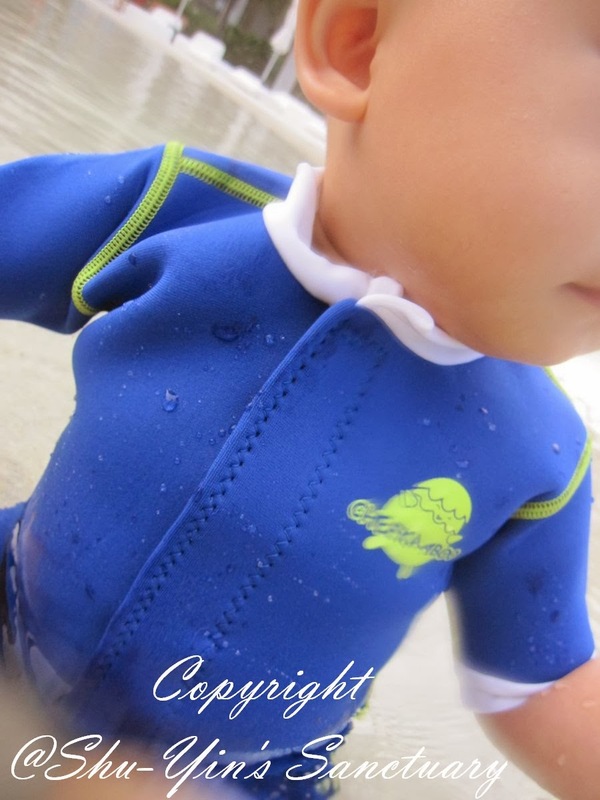 - Comment WHY they had chosen Cheekaaboo protective swimwear for your child. - Invite your friends to 'Like' the post, and tag 10 of their Facebook friends in the post. 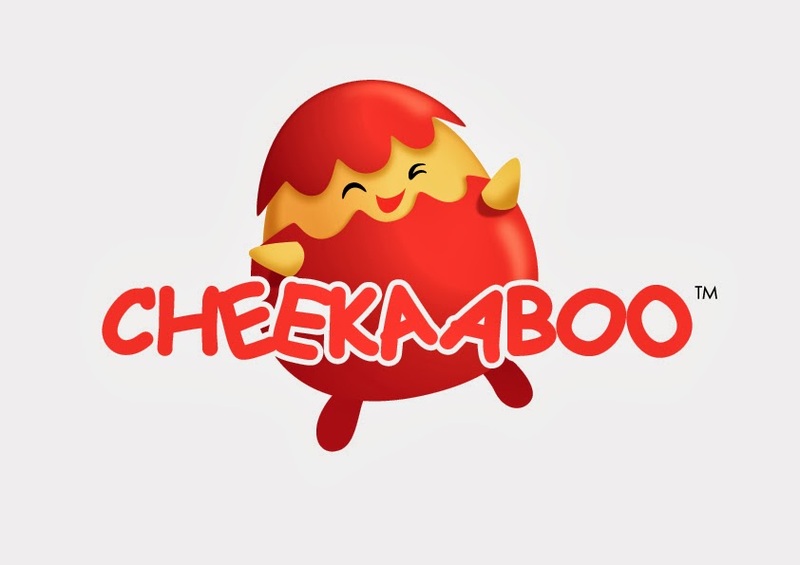 For more info, you can also visit Cheekaaboo's Website or Facebook Page. 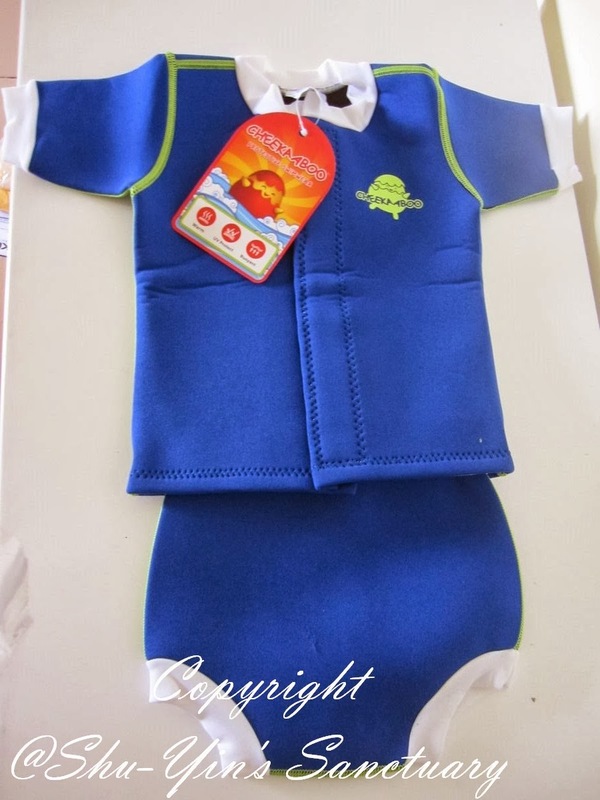 * Disclosure: I received a Cheekaaboo's Huggiebabes Swimsuit for review purpose, but no monetary incentive was received. All text and opinions are of my own and represents my honest opinion of the product(s).